These six photographs document the presentations of the Menninger Isabel Erickson Nursing awards. The Menninger Clinic is a facility for mental-health treatment, education, research, and prevention. Staff training and recognition is very important to the Clinic. 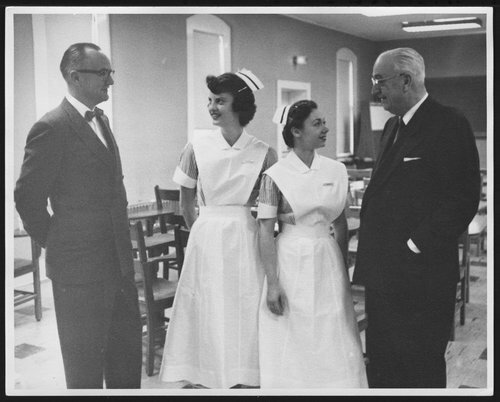 The Isabel Erickson Award in nursing - Photograph of the First Isabel Erickson Award ceremony at the Topeka State Hospital, Nov. 21, 1958. Shown are Alfred P. Bay, M.D., Superindendent of TSH; Susan Mason, first award winner; Sherry Kozel, runner up; and Dr. Karl Menninger.